Cariloha has now opened over 50 full, stand-alone stores in 14 countries, and has introduced an entire line of bamboo products, including apparel, bedding, bath goods, accessories, fitness wear, handbags and more all made of bamboo. Today, Cariloha is the only multi-store retailer in the world to provide an entire store experience that’s completely merchandised with products made from Cariloha bamboo. An ever-growing rich supply of bamboo makes it possible for Cariloha to continue offering an exclusive collection of bamboo products all enjoying the soft touch and green ‘footprint’ of this renewable resource. 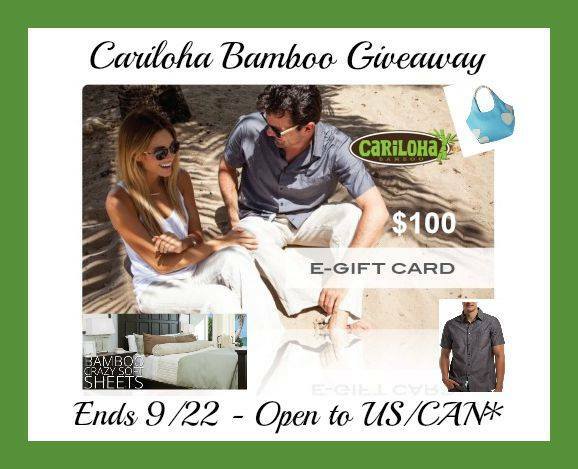 One lucky winner will have a $100 credit to use for Cariloha bamboo products or Del Sol color changing products. Canadian residents are reponsible for any applicable duties and taxes. Open to US & Canada excludes Quebec. I always liked bamboo products. I used to have a nice set of bamboo placemats. I love the Bamboo 2-in-1 Dresses. They are so cute and would be able to fit so many different occasions. I could wear to work casually, and also to church. This would be perfect. I would like the Resort Bamboo Bed Sheets - Caribbean Mint for my son's family. I like the bed sheets in Blue Lagoon. I love their resort bamboo sheet sets. I love the Bamboo 2-in-1 Dress - Stripe Charcoal! So cute! I would love to have the bamboo bath mat! I love the Bamboo Beach Bag in orange! Their sheets. There is absolutely no better purchase we have ever made for our bed.